The biggest event of the year just got bigger! February 7, 2019 – Howard Hanna Real Estate Services, the 3rd largest real estate company in the country, will host four BIG Open House weekends in the coming weeks to provide home buyers excellent opportunities to explore thousands of houses that are available for sale in their communities. The four BIG Open House events are a continued effort by Howard Hanna to maximize the opportunities for buyers to personally visit homes for sale, while also making it more convenient than one big weekend. “The internet can only do so much. Making homes available for buyers to tour in person provides great opportunities to ‘feel how the home lives’”, said Howard Hanna PA Regional President, Tom Ceponis. With open houses, sellers get maximum exposure in today’s market in addition to the 24/7 exposure on HowardHanna.com, the award-winning website with more than two-million views per month. During the Big Event Open House weekends, Howard Hanna Mortgage loan originators will be on site at Howard Hanna offices to answer questions or pre-qualify interested buyers for a mortgage. 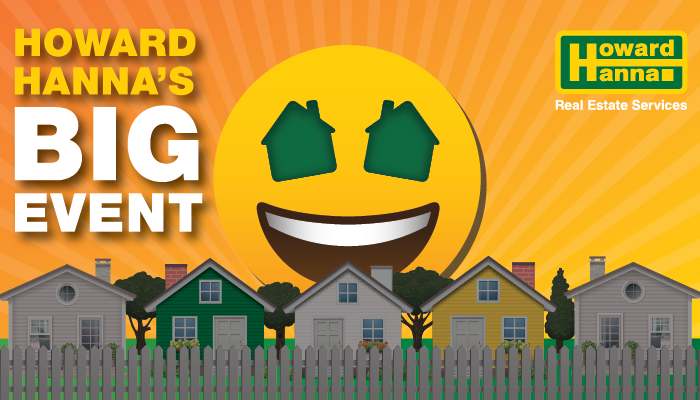 If you are thinking about buying or selling your home, or would like more information, contact your local Howard Hanna agent, stop by an Open House or visit HowardHanna.com/BigEvent. To find open houses in your area, visit HowardHanna.com/BigEvent. Contact: Deborah Donahue, Director of Public Relations, Howard Hanna Corporate Office, 412-967-9000, ddonahue@howardhanna.com.